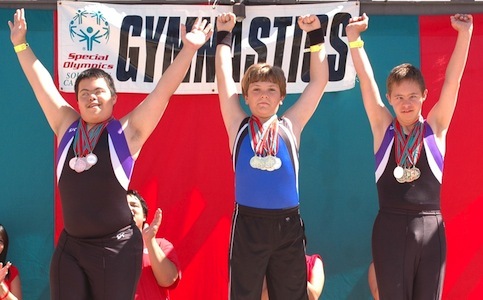 Twenty year old Chase Shirley is one of over 26,000 athletes served by Special Olympics Southern California. He has participated in Special Olympics for over ten years and has become a talented, multi-sport athlete. Chase says his autism makes him feel like he is “dodging a thousand balls at one time,” but competing in Special Olympics has improved his social skills. Chase’s parents said he learned the value in teamwork, how to lose, how to work towards a common goal, how to meet people, and how to make friends through Special Olympics.
" Anyone who knows Chase sees he doesn’t let his disability stop him from playing any sport." Anyone who knows Chase sees he doesn’t let his disability stop him from playing any sport. He also competes in baseball, horseback riding, mixed martial arts, basketball, gymnastics, floor hockey, softball, and track and field. With over 100 Special Olympic gold medals, there’s only one way to describe Chase Shirley: he’s a winner. Chase’s story is possible in part thanks to the investment of Christmas Records Grants in Special Olympics Southern California. Special Olympics California received one of the very first Christmas Records Grants in 1988, soon after the release of A Very Special Christmas. Over the next ten years, Los Angeles became a focus city for the Christmas Records Grants. The Program received over $160,000 to expand programming in Los Angeles schools, and in 1994 Los Angeles was approved for the “Mega-City” grant program. This led to $300,000 in Christmas Records Grants, which helped the Los Angeles area triple its number of athletes in four years. However, the California Program faced many outside challenges in the 1990s. This meant they were serving fewer athletes and had fewer volunteers. It was also hard to raise money and continue partnerships with schools and other organizations. So in 1995, Special Olympics California was split into two separate Programs: Special Olympics Northern California and Southern California. This split helped the Programs provide better services to more athletes. Then in 2002, Special Olympics Southern California applied for a Christmas Records Grant to help them build the new Program and recruit more athletes and volunteers. As of 2016, Special Olympics Southern California serves more than 26,000 athletes, supported by thousands of volunteers. Thanks to these efforts, and the early support of the Christmas Records Grants, the Program has continued to grow – including being the site of the 2015 Special Olympics World Summer Games in Los Angeles – and provides great programs to athletes like Chase Shirley.